Hi, I'm Angela and welcome to my web site! It is a work in progress so please bear with me. Now you can buy my latest book on Amazon for the Kindle! Just click HERE. I was born three months early with Cerebral Palsy at Hurley Hospital in Flint, Michigan. Cerebral Palsy is a medical condition that makes your muscles contract constantly, except for when you are sleeping. I tried taking the medication that will allow the muscles to loosen up when I was younger but the side affects were tremendous. There is now new technology that a pump can be implanted into the body which will distribute medicine when needed. After careful thought I decided against the pump. I have learned over time that the only part of my body that is really tight are my hips. The alternative to taking medicine is to exercise daily. If a person with Cerebral Palsy does not exercise enough their muscles contract and stay tight and the result would be the inability to move that part of your body. I have two of my original books also available for purchase online. Use the "Add to Cart" button to buy and download them! Poetry from the Heart is a collection of poems about God and friendship in a downloadable ebook. You will be given a link to download the book after your purchase. Thank you! 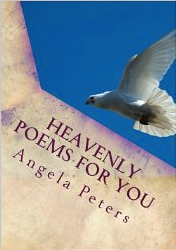 Heavenly Poems is my second book and shares thoughts about my faith and love for God. I hope you enjoy it! You will be given a link to download the book after your purchase. Thank you! I showed no interest in writing anything until the age of fifteen. It happened one day when a friend by the name of Heather came over for a visit. We were both in the kitchen hanging out talking about stuff when Heather suggested I should sit down and write my thoughts into poetry. I responded negatively to the idea. With her insistence I went to my room, turned on my computer and I did it! I wrote a poem and have not stopped writing since the year 1997. Two years after the year I started writing poems I was in a depression. I disliked being in a wheelchair. In a nut-shell I didn't like myself and people were mean to me in my first two years of high school. My poem writing from 1997-1998 consisted of writing about young men. Since I didn't like myself I thought by having a "boyfriend" my wheelchair would somehow disappear and I would be like any other teenage girl, because after all, I thought by having a boyfriend I would be accepted. Over the years I slowly had to learn that Jesus accepts me, my wheelchair and all. At age seventeen I brought my poems out into the open and shared them with friends. My speech teacher in high school (I had to take speech class because of my disability) told me that I could do something with my poems. I now share my poems with people through "Voice Chat" via the internet. I plan to write my poems as long as I live and share them with people. I give God all the glory for my poem writing being what it is today. I now write my poems about Jesus and God. My poems come from God, so God was working on his plan for my life back when I was fifteen. I share my poems with people whenever God opens a door for me to do so. Writing my poems and sharing my testimony and poems with people is God's plan for my life, I know that without a doubt in my mind. Below are a few samples of my poetry, I hope you enjoy them. We like being around people. Sometimes people are not around. We are then forced to be alone in flesh I say "in flesh" because when we are forced to be alone the truth is we are not alone. God is always present, and he promises never to leave us nor forsake us. The bible says : "Lo, I am with you always even until the end of the world". This is God's promise to us that we will never be alone! We can see God thru the things he has made. God wants himself to be real to us I know we can't see God with the human eye, but we can feel him all around us. Sometimes we need to be alone so in that quiet moment we can look around, and say, Yes God is right here with me! What will you say to me? Are you pleased with my life? In Your presence Lord all my hurt melts away. In Your presence Lord all my troubles go away. In Your presence Lord all I see is You. You want to be with me. In Your presence happy I am. From the thoughts that bring me down. In Your presence I see the light. You listen to me praise You. God, Your all I really need. In Your presence I am free. Psalm 30:11-12 Thou hast turned for me my mourning into dancing: Thou hast put off my sackcloth, and girded me with gladness; to the end that my glory may sing praise to thee, and not be silent. O LORD my God, I will give thanks unto Thee for ever. Thank you for visiting my web page. I hope you enjoy and find meaning in my poems. I'm now in the midst of writing my 3rd book. You may reach me online at heavenlypoems4you@yahoo.com. God bless you! Saturdays at the LaCafe in Waterford Michigan on Dixie Highway when I can go. I'm always looking for new places to read my poetry! Please email me with your ideas I am always happy to hear from new friends!